White-nose Syndrome has devastated bat populations across the eastern United States during the past six years, causing “the most precipitous wildlife decline in the past century in North America,” according to biologists. And this relentless disease keeps spreading into new areas. In February 2006 some 40 miles west of Albany, N.Y., a caver photographed hibernating bats with an unusual white substance on their muzzles. He noticed several dead bats. The following winter, New York Department of Environmental Conservation biologists documented what they called whitenose syndrome after seeing bats behaving erratically, bats with white noses and a few hundred dead bats in several caves. More than 6 million hibernating bats have died since then, making WNS the worst wildlife health crises in memory. Named for a cold-loving white fungus typically found on the faces and wings of infected bats, White-nose Syndrome causes bats to awaken more often during hibernation and use up the stored fat reserves that are needed to get them through the winter. Infected bats often emerge too soon from hibernation and are often seen flying around in midwinter. These bats usually freeze or starve to death. Mortality rates approaching 100 percent are reported at some sites. Little brown bat with white-nose syndrome in Greeley Mine, Vermont, March 26, 2009. The appropriately named fungus Geomyces destructans is the cause of deadly white-nose syndrome (WNS) in bats, according to research published today in the journal Nature. The study by U.S. Geological Survey scientists and partners, conducted at the USGS National Wildlife Health Center in Madison, Wisc., provides the first direct evidence that the fungus G. destructans causes WNS, a rapidly spreading disease in North American bats. "By identifying what causes WNS, this study will greatly enhance the ability of decision makers to develop management strategies to preserve vulnerable bat populations and the ecosystem services that they provide in the U.S. and Canada," said Anne Kinsinger, USGS Associate Director of Ecosystems. During the study, 100 percent of healthy little brown bats exposed to G. destructans while hibernating in captivity developed WNS. Additionally, the study demonstrated that G. destructans can be spread through contact between individual bats. "While our study confirmed that G. destructans is spread bat-to-bat, it is also important to note that virtually all pathogens, especially spore-producing fungi, are spread by multiple routes," said David Blehert, USGS microbiologist and an author of the study. "This is the reason that in an effort to further control the spread of WNS, resource management agencies have implemented universal precautions, including limiting human access to sensitive environments occupied by bats, decontaminating equipment and clothing moved between these environments, and restricting the movement of equipment between sites." White-nose syndrome (WNS) is known to predominantly affect hibernating bats. More than half of the 47 bat species living in the United States and Canada rely on hibernation for winter survival. Seven bat species, including two endangered species and one proposed species, have been confirmed with white-nose syndrome. The causative fungus, Pseudogymnoascus destructans (P.d. ), has been found on an additional five species, including one endangered species, without confirmation of the disease. UPDATE: The cave bat, Myotis velifer had been identified with Pd in Oklahoma in 2010. This detection of the fungus was found to be a false-positive result. At this time, cave bat is no longer on the list of species affected by WNS or documented carrying Pd. Biologists have found sick, dying and dead bats in unprecedented numbers in and around caves and mines from New Hampshire south to Tennessee and in the Canadian provinces of Ontario and Quebec. WNS is suspected in states as far west as Oklahoma. In some hibernacula (caves and mines where bats hibernate in the winter) 90 to 100 percent of the bats are dying. In a hibernaculum, affected bats usually have white fungus on their muzzles and other parts of their bodies. They frequently lack adequate body fat to survive until spring. These bats may exhibit uncharacteristic behavior such as moving to cold parts of the hibernaculum, and flying during the day and during cold winter weather when the insects they feed upon are not available. Field observations have shown that bats affected by WNS are characterized by some or all of the following: 1) a white fungus that grows on the nose, ears, and wing membranes; 2) depleted white and brown fat reserves by mid-winter; 3) a reduced capacity to arouse from deep torpor; 4) an apparent lack of immune response during hibernation; 5) ulcerated, necrotic and scarred wing membranes; and 6) atypical behavior causing bats to emerge prematurely from hibernacula in mid-winter. Laboratory studies have isolated a previously undescribed psychrophilic fungus, closely related to Geomyces spp, from bats affected with WNS. This fungus grows on the skin (nose, ears, and wing membranes) of hibernating bats, and laboratory studies revealed it grows optimally at low temperatures characteristic of hibernacula. There is histological evidence that the fungus sometimes penetrates the dermis, especially in areas associated with sebaceous glands and hair follicles. White-nose syndrome has been found in a bat in France, according to an article published in the Centers for Disease Control and Prevention's Emerging Infectious Diseases journal. White-Nose Syndrome Fungus (Geomyces destructans) in Bat, France reports that a bat found in March 2009 had the characteristic white fungus on its nose. Laboratory testing confirmed that the fungus was the same as that found on bats in nine northeast states where WNS has devastated bat populations. WNS is transmitted primarily by batto- bat contact. Biologists believe that people are inadvertently contributing to the spread since some caves used by people have WNS-affected bats, while other, nearby caves not used by people are not affected. Biologists have found the fungus in caves that no longer have bats. The Service issued a cave advisory in 2009 asking people to stay out of caves in affected states and adjoining states. The advisory also asks cavers - when visiting caves outside of the affected and adjoining states - to refrain from using clothing and gear that has been used in affected and adjoining states. The Service hopes that compliance with the cave advisory will help slow the spread of WNS until researchers can determine how to stop it entirely. Many federal and state agencies, organizations, and private individuals have closed caves on land they own. As a precaution, biologists and researchers wear protective clothing when visiting WNS-affected hibernacula, although there is no known human health risk associated with WNS. Until we discover how to eradicate WNS, we face the real possibility of losing entire bat species. The majority of bats dying in the Northeast has been little brown bats, one of the most abundant bats in the United States. Other affected bat species include tri-colored, northern long-eared, big brown, small-footed and endangered Indiana bats. Cave myotis and endangered Virginia big-eared and gray bats may be affected. Losing huge numbers of bats could affect the remaining bats’ ability to survive and adapt in the future through loss of genetic variation. Insect-eating bats are voracious predators of insects such as beetles, moths, aquatic flies and mosquitoes. The number of moths and beetles that damage our forests and crops could increase as we lose the bats that eat them. Increased pesticide applications might be needed to protect them from insects like forest tent caterpillars. Backyard gardeners may see increases in moth caterpillars or beetles preying on their gardens and may need to use pesticides or handpick pests from their plants. The many people who enjoy watching the silent flight of bats through the trees or over wetlands in the night sky may no longer have that privilege. With lower numbers of bats, our environment is already changing. We have no idea what our world could be like with a complete absence of bats. 1. What is white-nose syndrome? Hibernating bats in the northeastern United States are dying in record numbers, and we do not know the cause of the deaths. This wildlife health crisis, white-nose syndrome, is named for the white fungus evident on the muzzles and wings of affected bats. This affliction was first documented at four sites in eastern New York in the winter of 2006-07. Subsequently, we saw photographs taken in February 2006 of apparently affected bats at an additional site. WNS has rapidly spread to multiple sites throughout the northeast. Researchers associate WNS with a newly identified fungus (Geomyces sp.) that thrives in the cold and humid conditions characteristic of the caves and mines used by bats. The fungus could be responsible for the bat deaths, or it could be secondary to the cause. 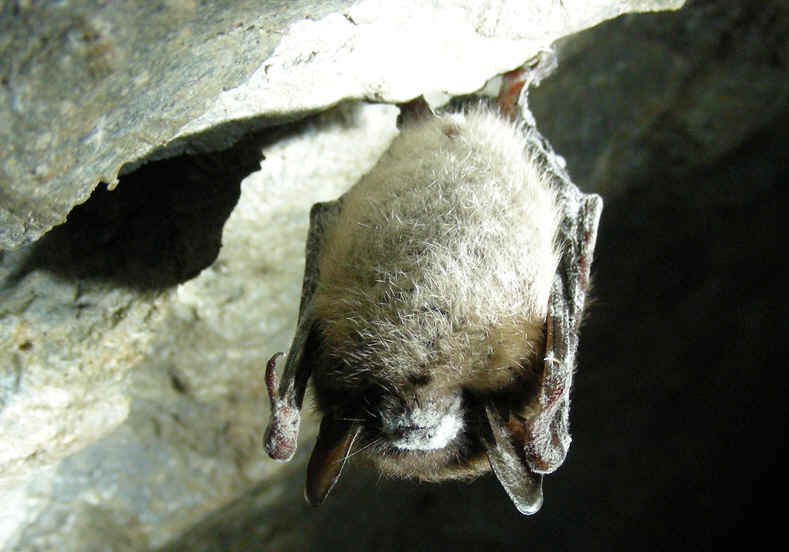 Bats affected with WNS do not always have obvious fungal growth, but they may display abnormal behavior within and outside of their hibernacula (caves and mines where bats hibernate during the winter). 2. How is WNS is transmitted? We believe that WNS is transmitted primarily from bat to bat. There is a strong possibility that it may also be transmitted by humans inadvertently carrying the causative agent from cave to cave on their clothing and gear. 3. Where has WNS been observed? 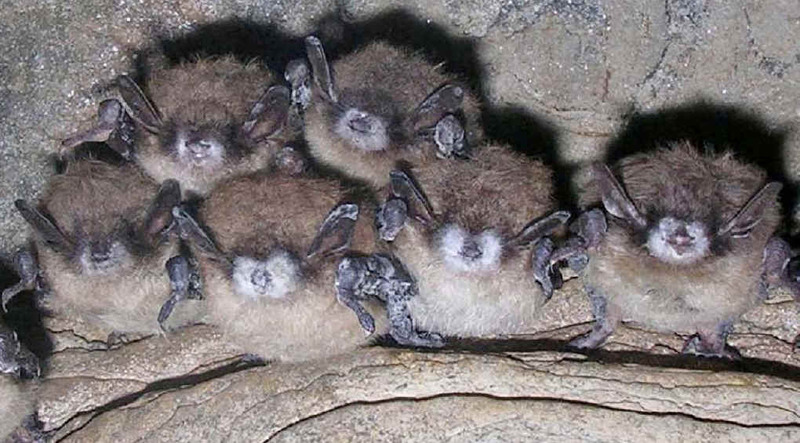 Biologists and/or cavers have documented WNS in bat hibernacula in New Hampshire, Vermont, New York, Massachusetts, Connecticut, New Jersey, Pennsylvania, West Virginia and Virginia. We expect this list of states to increase over time. 4. What are signs of WNS? Bats may lose their fat reserves, which they need to survive hibernation, long before the winter is over. They often leave their hibernacula during the winter and die. As winter progresses, we find increasing numbers of dead bats in the affected locations. WNS may be associated with some or all of the following unusual bat behavior: n White fungus, especially on the bat’s nose, but also on the wings, ears or tail; n Bats flying outside during the day in temperatures at or below freezing; n Bats clustered near the entrance of hibernacula; and n Dead or dying bats on the ground or on buildings, trees or other structures. Hibernating bats may have other white fungus not associated with WNS. If a bat with fungus is not in an affected area and has no other signs of WNS, it may not have WNS. 5. What should you do if you find dead or dying bats in winter or early spring, or if you observe bats with signs of WNS? n Contact your state wildlife agency, file an electronic report in those states that offer this service, e-mail U.S. Fish and Wildlife Service biologists at WhiteNoseBats@fws. gov, or contact your nearest Service field office (find locations at http:// www.fws.gov/northeast/offices. html) to report your potential WNS observations. n It is important to determine the species of bat in case it is a federally protected species. Photograph the potentially affected bats (including close-up shots if possible) and send the photograph and a report to your contact (above). n If you need to dispose of a dead bat found on your property, pick it up with a plastic bag over your hand or use disposable gloves. Place both the bat and the bag into another plastic bag, spray with disinfectant, close the bag securely, and dispose of it with your garbage. Thoroughly wash your hands and any clothing that comes into contact with the bat. See a short instructional video on our WNS Web site. n If you see a band on the wing or a small device with an antenna on the back of a bat (living or dead), contact your state wildlife agency or your nearest Service field office as these are tools for biologists to identify individual bats. 6. What species of bats are affected? Tri-colored, little brown, northern long-eared, big brown, small-footed and Indiana bats have died from WNS. Big brown bats are typically found in lower numbers in the affected sites, and few have been found with the signs of WNS. 7. What are the Service and other federal and state agencies doing to find the cause and a cure for WNS? An extensive network of state and federal agencies is working to investigate the source, spread and cause of bat deaths associated with WNS and to develop management strategies to minimize the impacts of WNS. The overall WNS investigation has three primary focus areas: research, monitoring/management and outreach. For example, we are conducting winter surveys to document and track affected sites, working with the caving community and local cave owners to target potential sites for surveys and protective measures, and securing funding to identify and fund research on the spread and management of WNS. In addition, the Service has a Web page as a central repository for up-to-date information and links to other relevant Web sites. 8. What should cavers know and do? The Service and the states request that cavers observe all cave closures and advisories and avoid caves, mines or passages containing hibernating bats to minimize disturbance to the bats. The Service asks that cavers and cave visitors stay out of all caves in the affected states and adjoining states to help slow the potential spread of WNS. Local and national cave groups have also posted information and cave advisories on their Web sites. 9. Does WNS pose a risk to human health? Thousands of people have visited affected caves and mines since WNS was first observed, and there have been no reported illnesses attributable to WNS. We are still learning about WNS, but we know of no risk to humans from contact with WNS-affected bats. However, we urge taking precautions and not exposing yourself unnecessarily to WNS. Biologists and researchers use protective clothing when entering caves or handling bats in the Northeast. 10. What is the effect of WNS on bats? Some 400,000 bats have died from WNS, and there seems to be no end in sight. We have seen 90 to 100 percent mortality of bats (primarily little brown bats) at several hibernacula in New York, Massachusetts, Connecticut and Vermont. However, there may be differences in mortality by site and by species within sites. The endangered Indiana bat hibernates in many of the affected sites. We are closely monitoring Indiana bat populations in many hibernacula and, to the extent possible, in their summer maternity colonies. 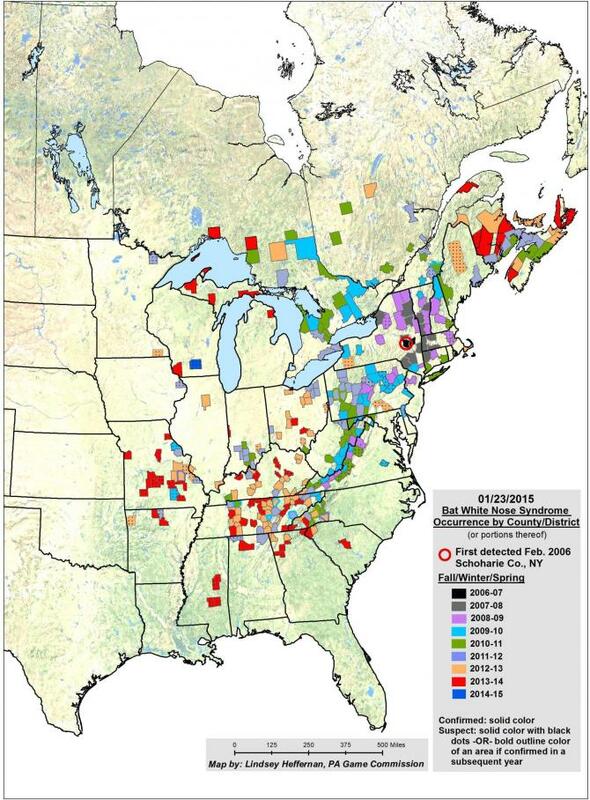 In New York and New England, we think as a result of WNS, winter counts of Indiana bats have declined. During the winter of 2008-2009 we conducted our biennial rangewide winter counts of Indiana bats. Early results from New York report significantly fewer bats. In addition to the Indiana bat, WNS has reached sites that contain the endangered Virginia big-eared bat. While no Virginia big-eared bats have exhibited signs of WNS yet, we are closely monitoring this species. 11. Is global climate change a possible cause of WNS? While the many possible causes of WNS are being investigated, there is currently no evidence to support a link between climate change and WNS. Microclimates in caves and mines where bats hibernate have been stable during the time period when WNS emerged, and there are no data indicating changes in insect prey populations in the affected region. Potential impacts of global climate change will continue, however, to be monitored as part of the investigation process.